Pastelbord is perfect for soft or oil pastels and pastel pencils — colors go on smooth, blend beautifully and stay rich and vibrant in both wet and dry pastel paintings. Or paint on Pastelbord to achieve amazing results with acrylics, oils, watercolors, gouache, charcoal, and more. White Pastelbord panels can easily be hand-tinted using thin washes of gouache or acrylics. Pastelbord panels are 1/8" (3 mm) thick, in Dark Green, Gray, Sand, or White. Ampersand’s Museum Panels — There is a Difference! Ampersand’s patented Archiva-seal technology means panels are: acid-free, eliminate support-induced discoloration, and are tested to last 200 years. Patented coatings designed so that paint colors remain true and brilliant. Made with premium hardboard for a warp-resistant panel. Endorsed by conservators and enjoyed by professional artists worldwide. 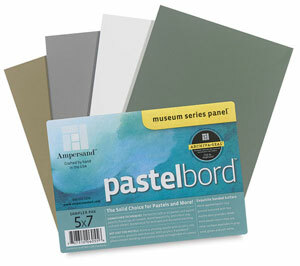 Colored Pastelbord Assortment — Package of four panels, 5" × 7" (13 cm × 18 cm) with one of each color: Gray, Dark Green, Sand, and White. Pastelbord is an excellent surface not only for pastels, but for acrylics as well. This archival clay-coated panel has a marble dust finish providing the perfect toothy surface for multiple layers of pastel application. See why using Pastelbord gives you an advantage when working with pastels — or even aqueous media.